Totalcar Magazine - New Cars - Could this be the ultimate VW Golf? There is no such thing as ‘the Golf’, not any more. Instead, the name has come to designate a plethora of models, from the original Golf to the Variant, from the GTI through the GTE to the E-Golf. The most recent addition to this family is the Golf Sportsvan, replacing the Golf Plus. 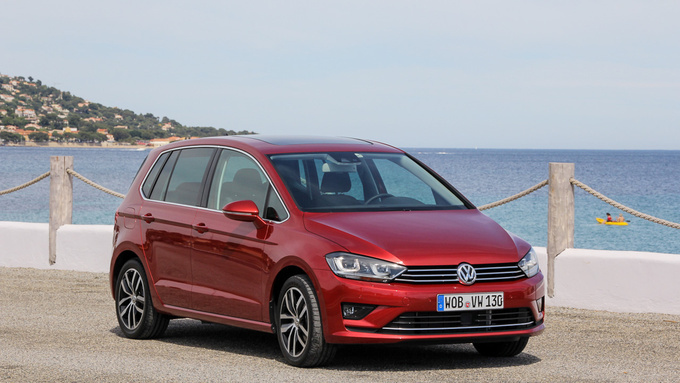 There will also be another, seven-seater monospace Golf – the Touran – arriving later on in 2014. I was somewhat confused by the name, although I concur it may have been my mistake. Initially I wasn’t sure what we’d be sampling because VW had just revealed the new SportWagen in the US, which is Americanese for the Golf Variant, hardly a novelty in Europe any more. But then I realised it was the SportsVAN, not WAGEN, which set things straight – except, why call it a Van when it clearly isn’t, not being a utility vehicle or even a Multivan type of monospace. The Sportsvan is much, much smaller than the Multivan. The ‘Sports’ bit I can understand. But then again: why worry about the name? Sportsvan it is, end of story, move on folks. 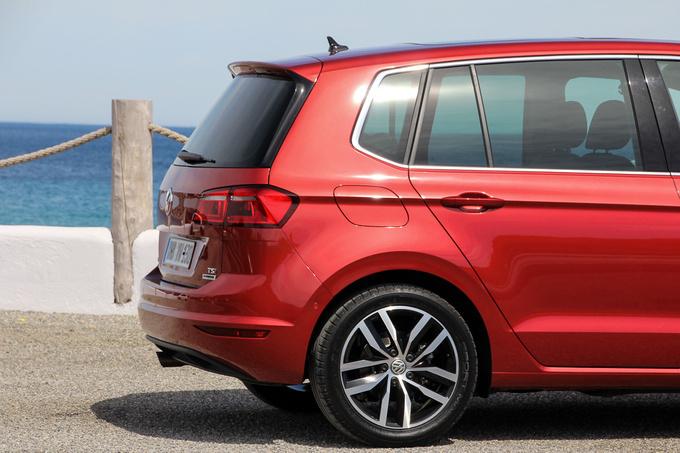 When compared to the regular Golf, the Sportsvan is 8 cm longer, almost a full centimetre wider and nearly 13 cm taller. Measured against the outgoing Golf Plus, you have an extra 5 cm width and 13 cm length; on the other hand, the Golf Variant is about 22 cm longer than the Sportsvan. But those are just statistics, and trying to get a grip on how the Sportsvan is different from other Golf models is not going to reveal its forte. Get inside, however, and it will. There is plenty of room in the front, and as for the back, I spent about 70 kms adjusting the rear seat, shuffling all the variations, and there was no single setting where there wasn’t plenty of comfort to be had. I mean plenty. With the front seat set for a 185 cm passenger, and the rear seat slid fully back, that’s the kind of rear legroom the aforementioned 185-cm-tall passenger enjoys. That’s the kind of car I was dreaming of as a child when we took long and tiring family trips. Rear seatbacks can be adjusted for recline, the cushion slides 18 cm forward or back, and there is a 40:20:40 split folding function, useful when you want to carry longer items such as skis or surfboards. There are folding trays on the back of the front seats, door pockets are deep and wide, side windows go all the way down, allowing kids to poke out their elbow like daddy always does. 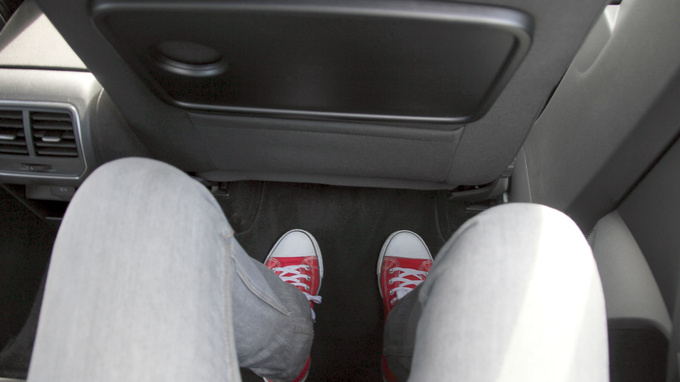 And unless the trunk is chock full of stuff, there is so much legroom in the back you can cross your legs and sit like a boss. And to top it all off, the centre console offers rear ventilation, delivering chilled or warm air to the rear at your convenience. Ticking the panoramic sunroof on the options list is a good idea as both front and rear row passengers will enjoy the extra light and sense of space it delivers. The front section of the roof also opens up, giving you the illusion of a cabriolet. All in all, life on board is jolly good, especially because nothing needs to be left behind when you set out for vacation. The boot starts out at 500 litres and easily expands to 590 if rear passengers are willing to sacrifice a bit of legroom. With no rear passengers on board you can just fold all seats and enjoy 1520 litres of space, measured to the roof level – that’s over 1,5 cubic metres for you. 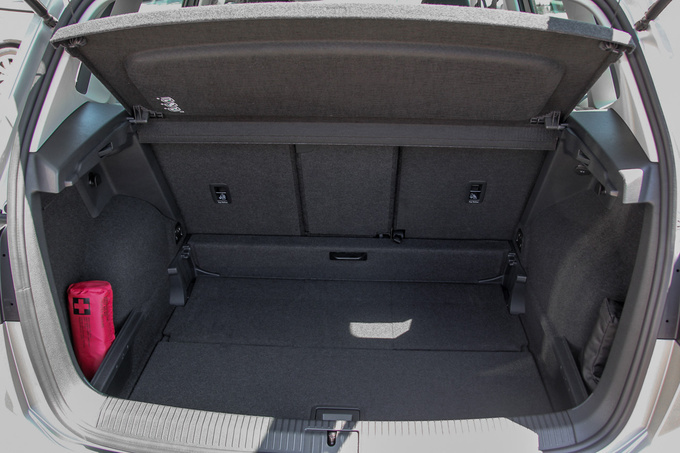 Add the option of a folding front passenger seat and you can carry items up to almost 2.5 metres in length, as opposed to the 180 cm length accommodated in the rear. The boot floor is adjustable in height, while the tonneau cover is accommodated in an underfloor recess, but those details almost go without saying. Up front you get the usual Golf atmosphere, even though the instrument panel is not the same as on the standard Golf. 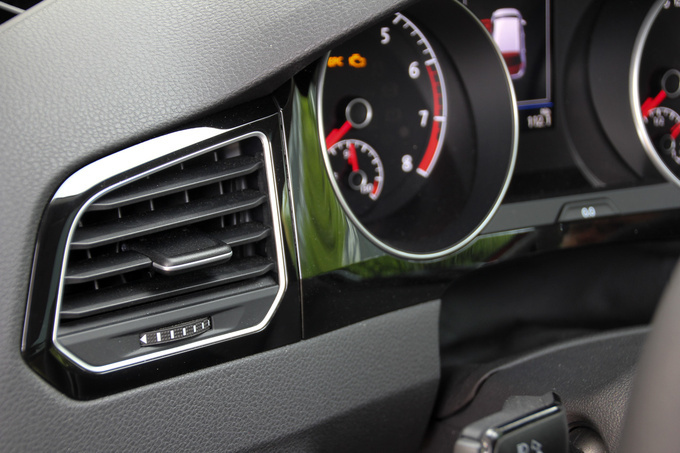 All knobs and switches are located at the usual place, there are no surprises, except for those neat recesses on top of the centre console, ideal for holding your parking slip. That’s a handy and elegant solution (and it also comes from the Daewoo Matiz as our editor-in-chief later enlightened me). If you have ever seen a Golf 7 you will not be taken aback by the strange shape of the steering wheel. I just couldn’t get over that weird ridge which made the whole thing somewhat uncomfortable to grab, despite the leather upholstery and the heating function. Wherever you look, reach or touch, from the switches on the steering wheel to the instrument panel, there is tangible quality here. Everything is just located ideally, with excellent operability. Top-of-the-range Highline models also give you plenty of satin chrome trim and detailing, a pretty sight no amount of piano black lacquer can ruin. Piano black is indeed the true cockroach of automotive detailing, surviving against all logical odds, proving that customers love bling even if it collects dust and fingerprints in a matter of seconds. The exterior design of the Sportsvan offers far more intriguing details then the interior. That’s not to say this is an exciting shape, you’d have to be on Volkswagen payroll to claim that. But it’s not exactly boring either. Commonplaces like harmonious or reserved describe it best. Whether it’s harmoniously reserved or reservedly harmonious is beyond me, but the point is, it looks good and offers you a few details to muse over. One of these details is the crease line running down the side of the car. Looking as sharp as on your dress pants, but executed in steel, it matches the line of the outside door handles with exacting precision. Another area of interest would be where the headlights meet the front grille. Now, this was nearly impossible to photograph so I’ll try to explain in words: the horizontal slats of the grill fold back under the hood, sort of like a shark nose, as they approach the leading edge of the headlight, which in turn follows suit with a similar twist of shape. This is only visible from a few select angles. You can always feel there is something significant going on here but you won’t see it unless you look for it. Initial engine options include two diesels (a 110 PS 1.6-litre powerplant and a 2.0-litre one with 150 PS, both EU6) and two petrol offerings (a 1.2-litre unit rated at 85 or 110 PS, and a 1.4-litre engine with 125 or 150 PS). You can specify a manual or a DSG gearbox but there is no AWD option at the moment. 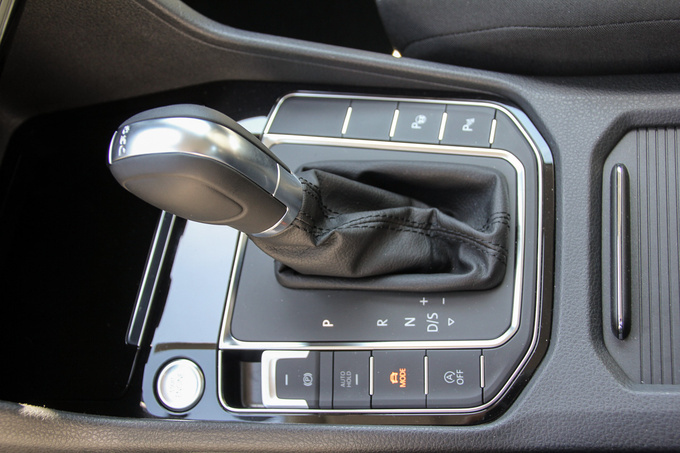 The smaller petrol engine comes with a five-speed manual, the small diesel adds the option of a seven-speed DSG. More powerful engines come with six-speed manuals, or double clutch units with six (150 PS 2.0TDI) or seven (110 PS 1.2 TSI, 125 & 150 PS 1.4 TSI) speeds. There is an abundance of driving aids and safety functions available. Many of these are standard specification, such as the ABS, ESP, brake assist, traction control, the electronic LSD function called XDS+, or the automatic post-collision brake function. Optional extras include adaptive cruise control, blind spot monitoring, lane-keeping assistant, traffic sign recognition, and a bunch of other stuff. This is the first Golf featuring what they call a Rear Traffic Alert system which monitors rear traffic as you start backing up. It also intervenes if necessary. 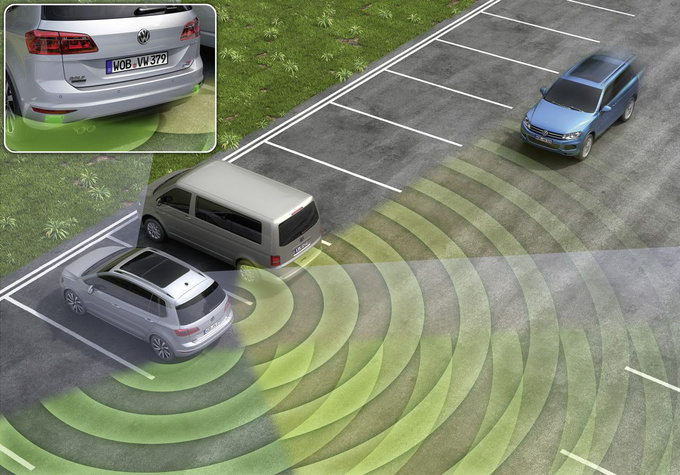 I can attest to its effectiveness: I was manoeuvring the car in a parking lot adjacent to a busy road and, sensing the traffic passing behind me, the system stopped the Sportsvan immediately. Because I had no idea it could do this, I panicked, thinking I must have hit something. This is a clear limitation but even so, this is a great system that will give you peace of mind as you park out. I tried following the GPS directions in a small mountain village, ending up in streets so narrow and steep I broke a sweat, but the fore and aft parking sensors helped me clear the situation. The only time the radar system could not help me with was when I came to what must have been the tightest, steepest right angle turn in the world, with a gutter strategically placed to deny ground contact for the front left wheel. The DSG gearbox could not handle the situation, I had to start off with the handbrake engaged. (This may have been an extreme situation but the DSG ‘box was just as easily confused when starting off on level ground. It was hesitant when I was easy on the throttle, and downright slow when I wasn’t.) 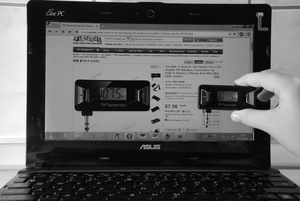 The option of the XSD+ promised an easy solution to the problem but it was obviously not designed for such situations. I ended up having to back further down and clear the obstacle at speed, just as we used to do it before the dawn of electronic aids. While clearly not suited for mindless speeding, this DSG-equipped, 150 PS Sportsvan was more than capable of some spirited driving. The dense Friday traffic didn’t even let me come close to testing the limitations of the car, equipped with an array of electronics and 225/45R17 Dunlop Sportmax tyres. But then everything changed when I was overtaken by a roaring blue thing and I had no choice but to put the pedal to the metal and try to catch up with that gorgeous Bugatti T35. 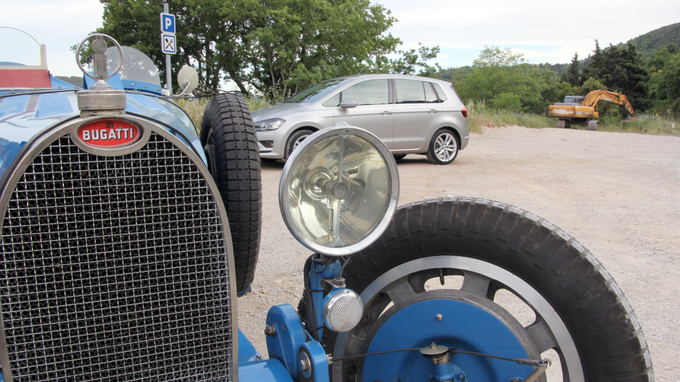 The notion of an 88-year-old classic car equipped with four narrow tyres being raced on the switchback country roads rewired my brain, I just had to catch them. It didn’t take long before I caught up with the Bugatti. Sure, his passage was blocked by a couple local cars but with its supercharged in-line eight-cylinder engine spitting out about 130 PS, the Sportsvan, rated at 150, was something of a match for the classic beauty, despite the fact that the Volkswagen weighed 1400 kg, and the T35 less than 800. Of course it would be silly to compare the two vehicles in any way, especially regarding their price – in that light, the Sportsvan feels even more of a bargain. If you want to compare prices, it makes far more sense to do so against the Golf. An entry level Golf (85 PS 1.2-litre engine, Start specification) costs something like €13,900, while a similarly kitted out Sportsvan weighs in at €15,000. This is quite a premium, and the car is even more expensive (by a more modest €255) than the Golf Variant, but I am sure there will be many people willing to pay this for the extra space and a commanding seating position. As you climb the specifications ladder, a Highline grade Sportsvan with a 1.4 TSI engine and a DSG gearbox will cost about €22,900, whereas the same in Golf outfit costs you €23,600 – this is of course highly market specific and is largely due to the market launch promotion that sells the Sportvan at €2200 off in Hungary. Check your local prices to decide between this and a Variant, but if you want my two cents, the Sportsvan may be a better choice for many people even if the price reduction is removed. The luggage compartments are roughly the same size (590 with rear seat moved forward vs 600 litres on the Variant), but the Sportsvan is significantly shorter, yet offers humongous leg- and headroom. If you want a great Golf for everyday use, go with this one. It is far more spacious than a regular Golf, yet looks less of a utility vehicle than the Variant, while offering plenty of room. 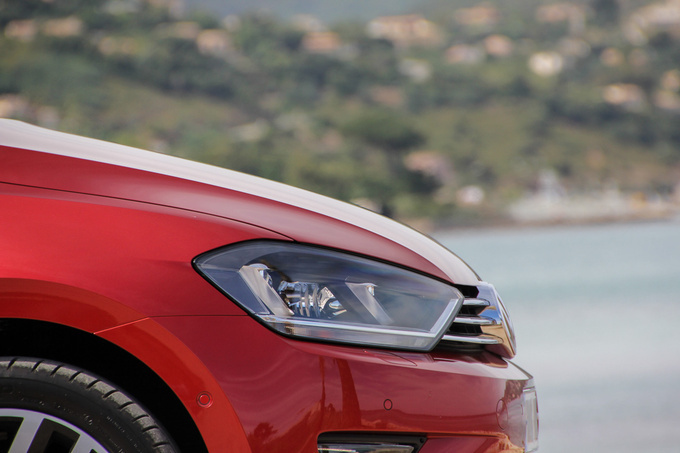 However, if you are after sporty driving, don’t let the name fool you: the regular Golf offers you better dynamism with its lower centre of gravity and more powerful engine options.